A bus driver named Pearl. She’s one tough cookie, that Pearl. Of course she has to be, to handle all the duties required of a city bus driver. She has to listen to the whining about the dollar bill machine not taking their dollar. She must put down the ramp for the wheel chair folks and pick up the permanent seats and then strap them in so they don’t roll around and hurt themselves during transit. She has to contend with fussy babies and police the rule breakers who try to smuggle McDonald’s bags onto the bus. NO EATING OR DRINKING! But that rule keeps riders from needing their “bus pants” that Sheldon must wear when he rides the bus. She has to listen to the rider who forgot to take her meds and is yelling obscenities at pedestrians out the window or the patron who thinks Pearl drove past their stop. “Didn’t you know I was supposed to get off there?” Pearl needs to be a mind reader too I guess. Last but certainly not least, she has to DRIVE that bus. She must maneuver 35 feet of steel and exhaust fumes in and out of busy traffic. It’s the same line of impatient cars and trucks that she has ticked off because she held them up for 4 minutes getting the latest Sassy Hoveround driver unbuckled and safely disembarked. 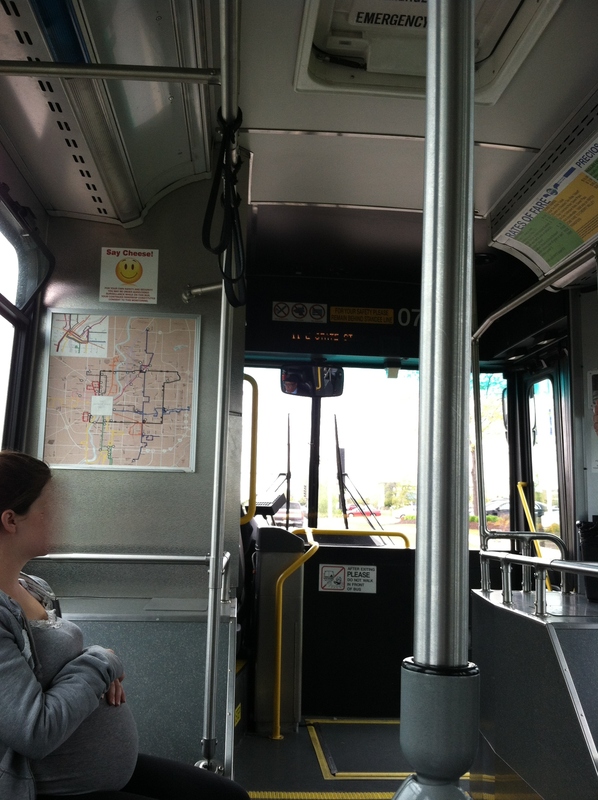 Humanity 101: riding a city bus. Yes everyone should do that once in awhile. You get to see all kinds of people, all ages and descriptions. It’s also a chance to witness some really bad hairstyles. The fashion police would have to pull the paddywagon up to load up all the offenders. Fortunately for me, they didn’t stop us. It also helps you to really appreciate your old vehicle. You know maybe the sunroof won’t open or your GPS stopped working. You’re frustrated that your leather seats make you hot in the summer and cold in the winter. I can tell you that an hour or so into my interminably long trek back to my hotel, that my old Expedition (with the broken grille from the deer colliding incident) was lookin’ PRETTY good! Pearl was quite nice to me though. Since I got on the bus and never got off. (I was doing recon for my next ride) Two hours on one route can facilitate bonding with your bus driver. When we pulled into the transfer station and everyone got off but me, I knew she was going to notice. I had to stay on though, to see where we were going. It was quite a ride I must say. So if you ever want some blog material or just need a good dose of Humanity 101 AND an appreciation for your life, grab a roll of quarters and hop on a city bus in your town!